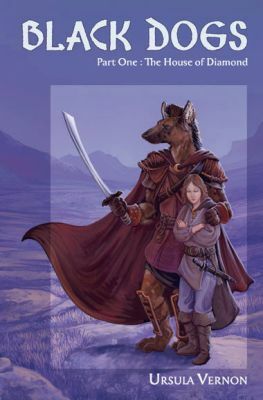 Black Dogs: The Hounds of Diamond is the first of two volumes chronicling the adventures of young Lyra, sole survivor of the massacre of her family’s estate. Along with a wandering dog-soldier, she is swept up on a mission for the elven nation of Anu'tintavel in its war against a powerful sorcerer. With the help of a pair of female elves, a scout and a warrior, the frightened, bookish girl discovers new talents and confidence that make her a key player in the elves’ conflict. The second volume, planned for release by Sofawolf Press in 2008, relates the conclusion of Lyra’s adventure and the culmination of the war. With wry wit and offbeat humor, Black Dogs: The House of Diamond builds a fully imagined world (both physical and metaphysical) that deftly sidesteps fantasy clichés. It is sure to appeal to longtime fantasy devotees as well as readers looking for a strong female adventure story. Ursula Vernon is a graphic artist and storyteller best known for her webcomic “Digger,” a repeat winner of the Web Cartoonists’ Choice Award and for which she was nominated for an Eisner Award (2005, Talent Most Deserving of Wider Recognition). Digger is also available in print form from Sofawolf Press. Ursula lives in North Carolina where she makes art and fights a birdseed-fueled war against the eastern grey squirrel. The color cover of this volume showcases Ursula Vernon's digital art. Eleven striking interior illustrations are provided by Chris Goodwin.